How Does My Home Appreciate? The idea of supply and demand certainly is true with real estate. If the demand for real estate is greater than the current supply, homes will appreciate faster because buyers are willing to pay more. Appreciation typically occurs and gradually over a long. Of time, typically to the tune of 2% to 4% per year. This is considered a balanced market or healthy appreciation. Increase can occur for a variety of reasons including increased demand or lower supply. Inflation and interest rates can also appreciate a property, but it can also decrease over time as well. So, what are the main things that affect home appreciation? Land is obviously in limited supply so there's always a constant demand for land. Homes near close proximity to schools and shopping can be some of the biggest factors and home appreciation. Research has even shown that homes within close proximity to a Trader Joe's and a Starbucks, actually increase appreciation faster and higher than those not within a close distance to these businesses. The market can change from one community to another and demand can be more aggressive in one neighborhood over another. An experienced real estate agent will understand where the market is the hottest. Job opportunities can automatically improve demand, especially when large corporations move headquarters or campuses into major cities. The size of the home and condition can increase the appeal factor. Most homes are directly tied into the needs of your family, meaning that you're not going to buy a five-bedroom home if there's just one or two of you. However, one bedroom condominiums may be more popular in urban areas whereas four or five bedroom homes popular in more suburban areas close to good schools. The condition and age of the property can also be a factor in appreciation. New construction homes are popping up in communities and developments all across the country. Older homes making upgrades like granite or quartz counters or energy-efficient appliances and materials can be what these homeowners need to raise appreciation in an area booming with new construction. Read More: Is New Years a Good Time to Sell a House? Properties in an improved social and physical infrastructure can create more demand, which in turn increases appreciation in the home and property surrounding it. Inflation raises the cost of goods to meet up with wages, which will increase home prices as well. 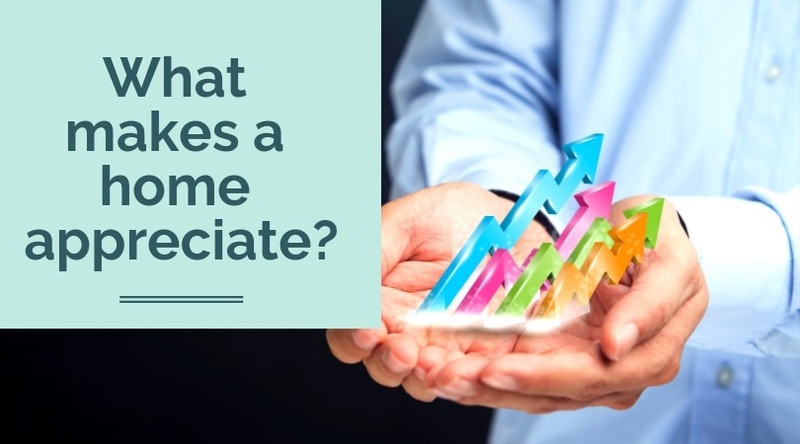 While these are just a few major factors that have to do with appreciation, most homes will generally appreciate over time if well cared for and if the market increases.